FA: Jeff Lowe and Mark Wilford, 9/87. Sandblaster climbs the left-hand of three parallel cracks in the middle of the northwest face. 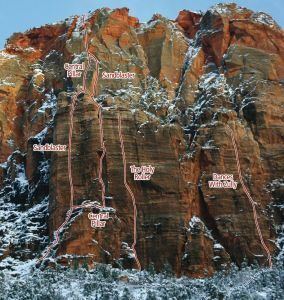 To reach the climb park about 0.75 miles up the canyon from Canyon Junction in a paved pull-out on the east side of the road. There isn’t a good established trail to the base of the formation. You are on your own on this one. Hike up the steep bushy hill to the base. Pitch 1 goes up a left-to-right leaning ramp system to gain the base of the main crack. Rack: 2 ea to 6”, bigger pro optional, nuts, 2 ropes, extra cordage for descent anchors. Descent: either rap from the top of Pitch 3 or, if you continue up the remainder of the route, descend into one of the canyons on either the north or east side of the formation and follow those drainages back into the main canyon. Descending off the backside of the formation requires much down climbing and rappelling. Which SuperTopo guidebooks include a topo for Sandblaster?